Yu-jin is a good son, a model student and a successful athlete. But one day he wakes up covered in blood. There's no sign of a break-in and there's a body downstairs. It's the body of someone who Yu-jin knows all too well. Yu-jin struggles to piece together the fragments of what he can remember from the night before. He suffers from regular seizures and blackouts. He knows he will be accused if he reports the body, but what to do instead? Faced with an unthinkable choice, Yu-jin makes an unthinkable decision. Through investigating the murder, reading diaries, and looking at his own past and childhood, Yu-jin discovers what has happened. The police descend on the suburban South Korean district in which he lives. The body of a young woman is discovered. Yu-jin has to go back, right back, to remember what happened, back to the night he lost his father and brother, and even further than that. There seems to have been a great rise in appreciation and appetite or translated crime writing in the past decade or so, spurred no doubt by the 'Scandi Crime Wave' phenomena, but going more broadly than that too. We've seen French author Fred Vargas win multiple awards in the UK for the English translations of her work, Romanian bestseller EO Chirovici launched in English in a big way, and plenty of other great tales brought to English readers, particularly from continental Europe. International publishers have been a little slower to plunder the treasures that have been delighting non-English speakers in Asian countries and languages, sometimes for decades. So it's great to see the recent mini-wave of Japanese crime fiction getting translated (Keigo Higashino, Natsuo Kirino, Miyuki Miyabe, Fuminori Nakamura, Masako Togawa, Seicho Matsumoto, Hideo Yokoyama, etc). Anglophile readers now get a chance to experience the provocative storytelling of million-selling and award-winning South Korean crime writer You-Jeong Jeong. THE GOOD SON is her first novel to be translated into English (she’d already been translated into several other languages). A young man who has suffered from seizures and a mysterious ailment throughout his life wakes in a bloodied haze, only to discover his mother’s razor-slashed body at the bottom of the stairs of the house they share near the Incheon waterfront outside of Seoul. He has snatched memories of his mother calling his name the night before: but did she want his help, or his mercy? Realizing a call to the police would mean instant arrest, he spends the following days cleaning up, fending off his family’s calls, and trying to work out just what happened. He was once the good son, but is he now a killer? Who can he trust? Yeong (and Kim’s translation) takes readers on a confronting ride into mental illness, twisted family relationships, and the unclear realm of memory vs reality. This is not a comfortable read, or a traditional crime novel with a cop or outside sleuth at its heart. Guided by the first-person narration of an unreliable, tormented young man, readers are plunged into a harrowing tale that builds in an elegant and disturbing way. We slowly uncover the truth, via Yu-Jin’s skewed perspective, with plenty of secrets and horrors being revealed. 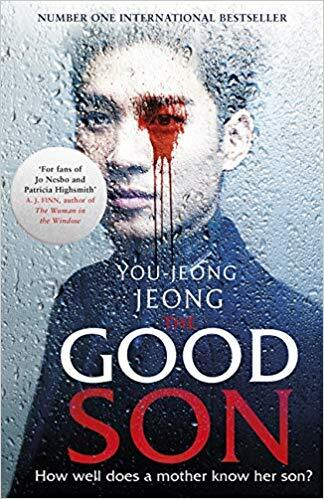 Something different, THE GOOD SON is an atmospheric, creepy thriller from a master storyteller.